Bulky Weight Yarn Size #5- I used Bernat Pipsqueak in Whitey White. Worsted Weight Yarn #4 – Yarn pictured is Caron Simply Soft in soft pink or soft blue, white, black, and chocolate. Size H/5.0mm Crochet Hook — or hook size needed to achieve gauge. Gauge: Please check your gauge, to ensure correct sizing. Photo tutorials on how to create magic ring on my blog, here. Skill Level: Intermediate, due to the fact that the pipsqueak yarn makes it very difficult to see stitches. Sizes: These sizes are approximate and actual measurements of the child would be best. Newborn measurement and can fit up to 2 months, depending on the child. Plush Toy: Measures approx 5 inches tall and approx 7 inches long. Ch 2 at beginning of rounds does not count as a dc. When joining at end of rounds, join to first dc with a slip stitch. This hat is worked in the round, there is no turning. The ( ) at the end of the round/row is the total stitches in that round/row. With bulky white yarn and “H” hook, or hook used to get correct gauge. Round 5-9: Ch 2, 1 dc in each st around, join with a sl st to first dc. (36) (5 Rows) fasten off and weave in ends. Using worsted weight yarn and “H” hook (or hook used to achieve gauge), start by making the inner part of the ear. I used Caron Simply Soft in colors soft pink and soft blue, for girl and boy. Continue to sc around the entire ear, doing 2 sc in each of the bottom corners and join with a sl st to first sc, fasten off. Repeat for your second ear, weave in ends, then set aside. Using same bulky white yarn that you used for the hat and “H” hook. Pattern is the same as the inner ear, except for how to finish. This will give you a slightly larger outer ear, compared to the inner. Continue to sc around the entire ear, doing 2 sc in each of the bottom corners and join with a sl st to first sc. Do not finish off yet. Now you are going to place the inner ear inside of the ear you just created. Sc through both layers, to combine them. Join with sl st, fasten off and weave in end. Using the tapestry needle sew the two corners of the ear together, so it has a folded shape. Then, going through the full thickness of the ear, sew it on to the hat at rows 5-6. Using ‘E’ hook with worsted weight yarn and ‘G’ hook with bulky yarn. Gauge is not important for the plush. Just want stitches tight enough, so that you can’t see the stuffing through them. The reason I change hook size is due to the fact that it would be very difficult to use an ‘E’ hook with bulky yarn. You will be working in the round with no seam, which means there will be no joining at the end of rows. I recommend using a stitch marker to keep track of rows. Head- Starts with ‘E’ hook and worsted weight yarn. Round 16: *sc2tog, 1 sc in the next st*, repeat from * to * around. (12) Stuff with polyfil. Round 17: sc2tog around. (6) Fasten off, leaving a tail to close. Using a tapestry needle, go through the remaining 6 stitches, pull tight to close and weave in end. Inner Ear: Pink or blue, for girl and boy, worsted weight yarn. Ch 5, sc in 2nd chain from hook, sc in next chain, hdc in next chain, dc in last chain. Fasten off yarn and weave in ends. Make 2nd inner ear. Outer Ear: Bulky White- same as inner ear, except how to finish. Ch 5, sc in 2nd chain from hook, sc in next chain, hdc in next chain, dc in last chain. Fasten off, leaving a tail for sewing. Lay the inner ear on top of the outer ear and stitch together. With tapestry needle, stitch on nose, eyes, and ears. I use French knot for eyes between round 8 and 9, with 5 stitches between them. Nose around the magic ring and ears are on 2nd row of bulky yarn. Round 18: 1 sc in each st around. (12) Stuff with polyfil. Round 19: sc2tog 6 times. (6) Fasten off, leaving a tail for sewing closed. Finish stuffing, if needed. Using a tapestry needle, go through each of the remaining 6 sts and pull tight to close. Weave in end. Sew head onto body at desired angle. Round 3: 1 sc in each st around, changing to white worsted weight yarn in the last st of the round. (8) Fasten off brown and weave in ends. Round 12: 1 sc in each st around, changing to white bulky weight yarn and ‘G’ hook in the last st. (12) Fasten off worsted weight yarn and weave in ends. Round 16: Ch 1, turn, sc in the next 6 sts. (6) Fasten off leaving a long tail for sewing. Ch 6, sc in the 2nd chain from the hook and in remaining 4 chains. (5)Fasten off, leaving a tail to sew on. Sew on using tapestry needle. Finishing sewing: Stuff the legs with poly fill. I stuff firmly, so that my lamb will stand up, but that is up to you. You will have a top shoulder part, which I sew on so that the top is level with the bottom of the ears. I essentially want a line that runs from the bottom of the ear, across the top of the legs, and aligned with the tail. Just helps me to place, when sewing. Sewing around the leg, you want to go almost to the middle of chest/stomach, so that the lamb’s legs will be straight. I added a little bit of extra stuffing, as I was sewing on, so that the shoulder would be a little puffed out. When all legs are sewn on I have the innermost part of legs almost touching, and an inch between the front and back legs. Single Crochet Two Together (sc2tog): Insert hook in stitch, yarn over and pull up a loop, insert hook into next stitch, yarn over and draw up a loop (3 loops on hook), yarn over and pull through all loops. Half-Double Crochet (hdc): Yarn over, insert hook into stitch, yarn over and pull up a loop (3 loops), yarn over and draw through all three loops. Double Crochet (dc): Yarn over, insert hook into stitch, yarn over and pull up a loop (3 loops), yarn over and draw through the first two loops, yarn over and draw through the remaining two loops. 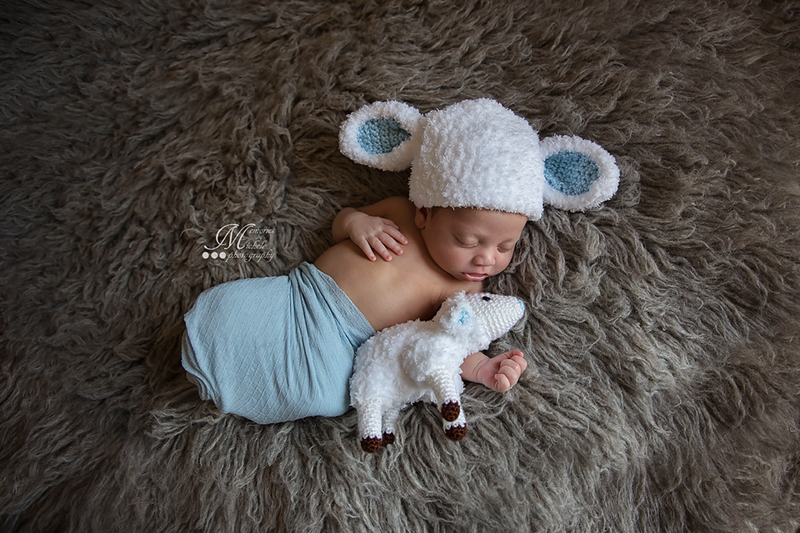 Adorable main featured photo by Memories by Michele! 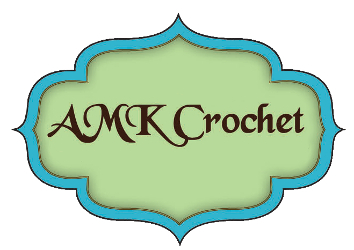 If you love these free patterns, please consider donating, so that AMK Crochet can keep creating. Thank you! Or using one of my affiliate links, such as Furls Crochet Hooks. You can see my favorite in the pictures above, a Cocobolo ‘H’ hook.